Vitanica is dedicated to serving women by providing education, research, and the finest quality in effective natural supplements. 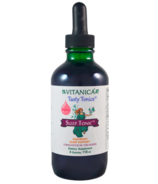 Vitanica strives to use the best ingredients in their products and the product line is run in small batches to ensure the freshest products possible. Also, the entire product line is vegetarian suitable with the use of plant based capsules. All Vitanica products are formulated based on scientific research and/or clinical research and experience as conducted by Dr. Tori Hudson in her women's health practice. Dr. Hudson is a well respected authority on natural healthcare for women.